Otto Schnarr, left, and Matthew Waldersen check out the Advanced Data Acquisition and Telemetry System in an Armstrong laboratory. A network and communication architecture that can more efficiently move data from research aircraft, while using half the bandwidth of traditional methods, could eventually also enable data collection of precise measurements needed for testing the next generation of X-planes. 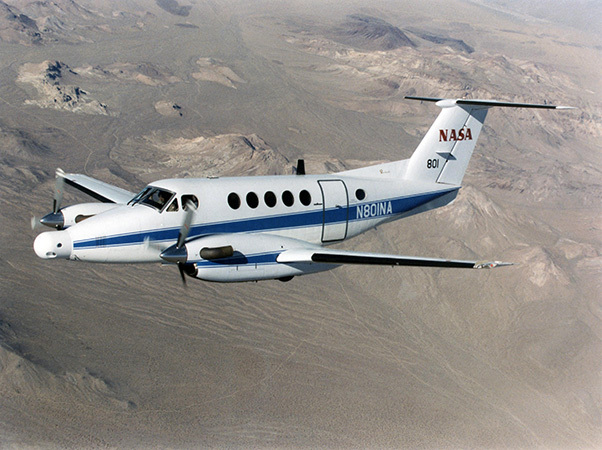 Called the Advanced Data Acquisition and Telemetry System, or ADATS, researchers at NASA Armstrong Flight Research Center in California integrated the new systems into a NASA King Air recently for a series of three flights following extensive ground testing. The new system can move 40 megabits per second, which is the equivalent of streaming eight high-definition movies from an online service each second, said Otto Schnarr, principal investigator. Researchers aren’t looking to make binge watching easier — they are interested in the system’s speed in moving large amounts of data up to four times faster than previous network-based telemetry efforts and up to 10 times faster than current systems Armstrong researchers are using, Schnarr explained. All of this capability is gained without new architecture and using the advanced modulation technique to save spectral bandwidth, time and research dollars, said electrical engineer Matthew Waldersen. In addition, the system allows people to participate in the flight test from wherever a secure network is available. As many as 3.3 million sensor measurements per second can be acquired, or a focused data set can be targeted to free up bandwidth for other tasks, like streaming high-definition video simultaneously, he added. The Advanced Data Acquisition and Telemetry System team includes front row from left Mario Soto, Sam Habbal, Tiffany Titus, RIchard Hang, Randy Torres, Thang Quach, Otto Schnarr, Matthew Waldersen, Karen Estes, Andy Olvera, Stanley Wertenberger and Rick Cordes. In the second row from left are John Atherley, Doug Boston, Tom Horn, Brady Rennie, Chris Birkinbine, Jim McNally, Martin Munday and Tony Lorek. 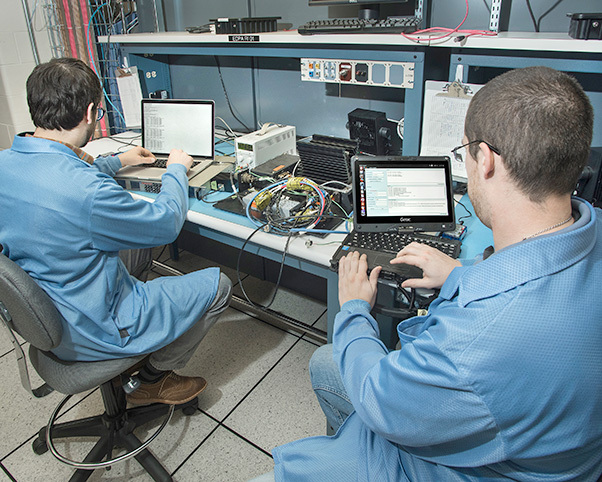 ADATS aims to advance flight test data acquisition and telemetry systems using an Ethernet via telemetry subsystem that wirelessly transmits test data and an advanced data acquisition system that allows remote researchers to command experiments and receive data collection during flight. The flights capped a three-year effort to fill in existing gaps in the technology, such as range, instrumentation and system design challenges. ADATS team members have made well-received presentations at the center that led to additional brainstorming session on potential uses for the technology. Building up the capability is the next step. Maturing the technology could be useful for upcoming X-plane testing. For example, measurements of airflow data measurement along the entire face of a fan engine could be efficiently researched, Horn explained. Another advantage is unlike traditional data collection that can experience loss of data, or “dropouts,” ADATS can eliminate the loss with this data collection method. However, delays can still occur and researchers are looking into understanding the ramifications of that for safety. 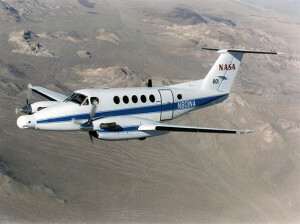 A NASA King Air successfully tested the Advanced Data Acquisition and Telemetry System during a recent series of three research flights. In addition, the system also could have implications for uninhabited air vehicles and systems for uplinks and bandwidth management. For example, aircraft like the Ikhana or Global Hawk could gain efficiencies. ADATS also could work in combination with an Ethernet-based fiber optic sensing system to streamline data collection. The ADATS effort can be traced back to The Hi-Rate Wireless Airborne Network Demonstration (HIWAND) in 2005, which also flew on the King Air. It demonstrated in flight a network-enhanced telemetry system that enabled connectivity between air and ground, including airborne Internet access. The capability was focused on allowing scientists and others to downlink scientific data and uplink critical information to airborne sensors more efficiently. 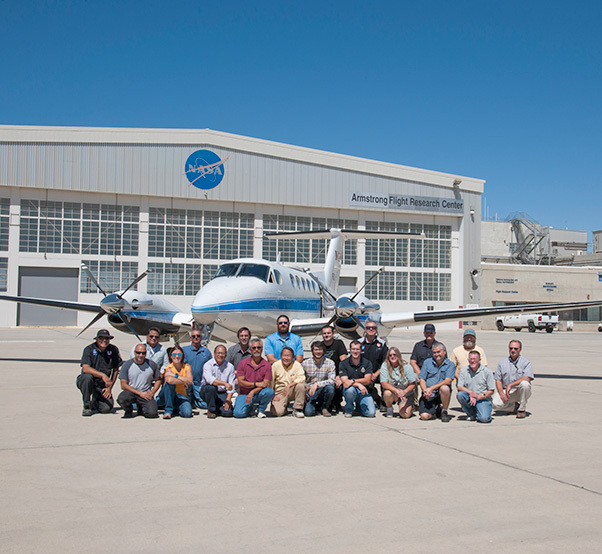 NASA’s Flight Demonstrations and Capabilities project, which is part of the Integrated Aviation Systems program, is funding the current effort.